Headphones make excellent promotional products because they help people experience the joy of music! These days, no one leaves the house without this device, and should they be personalised with your corporate logo, your clients will be exposed to your branding many times throughout the day. There are many styles to choose from in this category, we stock over ear styles, which are padded for extra comfort during wear. 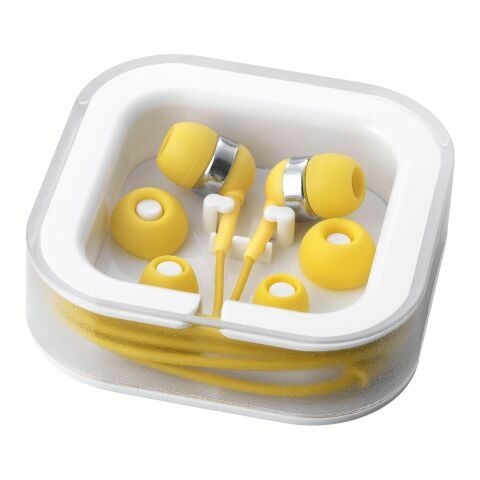 There are also in-ear, these are more lightweight and do not take up much room in a pocket or bag. We also have modern earbud styles that wrap around the ears, these are ideal for gym goers to stop the earbuds from falling out whilst running. There are wireless earbuds, which are also excellent for working out but would benefit anyone who hates the eternal tangled mess traditional headphones always seem to get in! Whichever promotional phone accessories you choose; they can be personalised by having your company design printed or engraved. At the end of the 1970s, the Walkman revolutionised music listening. Headphones still played a minor role at that time, but grew quickly and became real fashion statements. There are many styles available. Headband headphones consist of two sides, which are interconnected via a bracket. In-ear earphones are inserted directly into the ear canal and can suppress ambient noise. There are also wireless, which removes the annoying need to untangle wires every time you want to listen to music. They have a battery and work with an analogue radio transmission between 50 and 100 meters. In order to be able to listen to music during exercise, there are special sports headphones, which have a compact design. These make excellent stand alone products, but can also be used as part of tech related gift bags. These could include any other promotional iPhone & mobile phone product or USB flashdrives, pens. Music is a huge part of people's day; it has the ability to change our moods so rapidly that it can often be used to make us feel better! This is why these devices are used every day. They are everyday objects that are particularly popular with younger audiences, but are used by people of all ages. They can be connected to laptops, smartphones and tablets and allow us to listen to music or talk on the phone, no matter where we are. These promotional products are definitely useful and the more useful an item is, the more frequently it is used and the stronger grows the sentimental value of the item. The sentimental value is decisive for the effect of a promotional product. By applying your logo or slogan, you will be creating promotional items that will be used and viewed countless times throughout the day. It remains in the back of their heads and is omnipresent while making purchase decisions. Make use of these practical everyday objects as an efficient advertising medium. Headphones are ideal for transporting your advertising message. You can easily incorporate your logos or slogan into their dynamic design and make a modern impression on customers, employees and business partners. They are often used for traveling and in public. Owners will notice your logo on this promotional product, as well as all surrounding bystanders. Advertising mediums such as our headphones or the closely related printed speakers with a personalised touch can raise the awareness of your company. These can be even more successful than classic advertising media, such as radio or TV. You can acquire new customers, bond with existing customers and create a memorable value for the company. Whether as gifts for new customers, at seasonal events for existing customers or as a motivation for employees. Even at trade fairs their use is recommend. With headphones, you distance yourself from the traditional advertising media of the competition and provide your audience an attractive everyday object that makes you memorable! We of allbranded want to be more than just an online store for you. We are the creative partners that will help you to find the perfect promotional product and assist you with your advertising campaigns. With allbranded you choose reliable and fast advertising professionals. If you have any questions you can contact us via live chat or our customer service.